The following is a post from Jackie. Have you seen those totally cool rugs that are made from old T-shirts? A few months ago I decided I was going to make one. I purchased the latch hook material to go with the latch hook tool I got from my grandma. Before I started cutting up T-shirts, I decided to read those tutorials a little closer only to find out that they took a really long time to make. I decided to put the project on the back burner. However, one night I had a dream about T-shirt rugs. (Yeah, I dream about craft projects.) In my dream I was using a hand towel and my sewing machine to make a rug. Guess what I did when I woke up? Well, I ate breakfast, took care of the kids, and did a few other things. But, after that, I got to work on my “new” T-shirt rug. Would you like to make one, too? First, you will need to gather some supplies. Don’t feel limited to just using T-shirts. 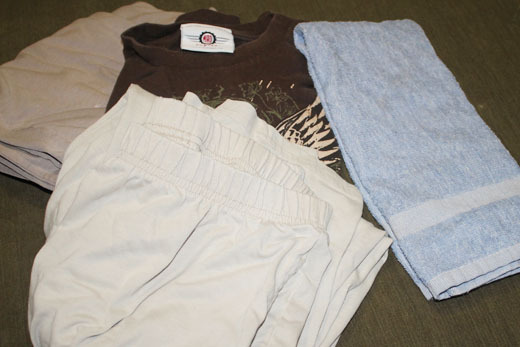 For this project I decided to let go of a few pairs of my old stretch pants that passed their prime a few decades ago in addition to a T-shirt. 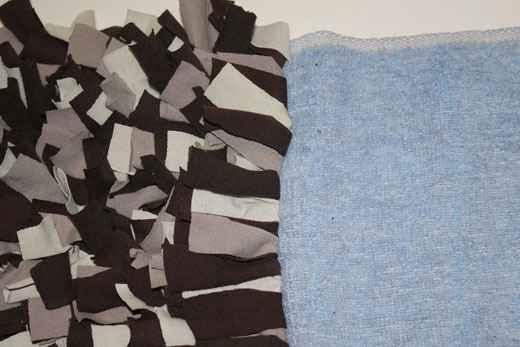 You could even use an old jersey knit sheet as a source of fabric. 1. 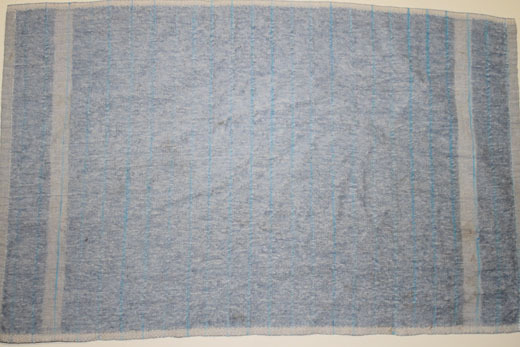 Using the chalk, water soluble marker, or even a pencil make marks along the towel in 1″ increments. The lines need to be made vertically from long side to long side of the towel. Make sure you can see the lines you made because they are critical to making the rug. I did want to note that the hand towel was 16 inches by 26 inches. I suggest using a hand towel that is similar in color to your T-shirt strips. I did not do this, but definitely will next time. To make the rug pictured at the top of this post I used approximately 900 T-shirt strips. The amount you need will vary depending on the size of your hand towel. 3. 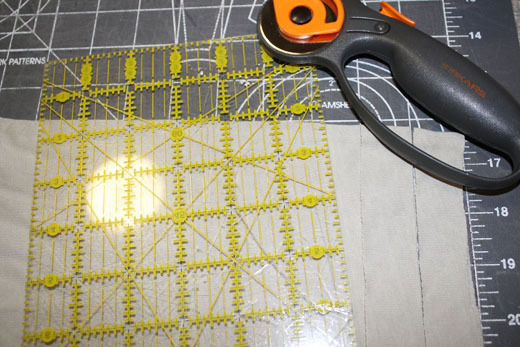 Lay out one row’s worth of strips next to your sewing machine. 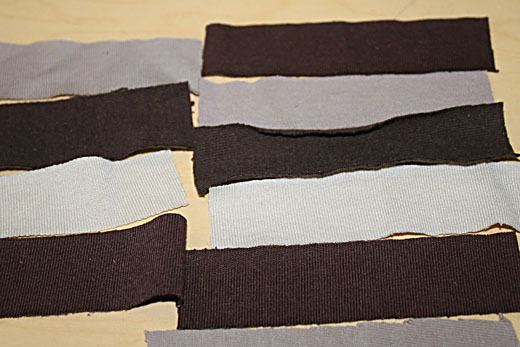 By laying out the strips first, each row can be sewn faster. I made a pattern out of my strips, but you can use strips that are all the same color or just be totally random. Each of my rows had an average of 36 strips in them. I recommend each row have between 36 and 40 T-shirt strips. 4. 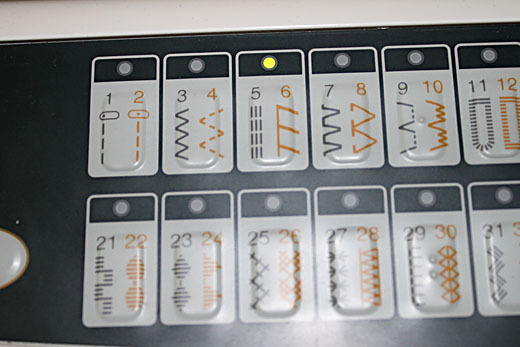 Set your sewing machine to the triple stitch (#5 on my machine). This will ensure that the strips are securely sewn to the towel. 5. Take 2 or 3 T-shirt strips at a time and center them on the line. Scrunch the strips a little bit so that your rug will be nice and full. Sew right down the line adding more strips as you go. This is what the row should look like when you have sewn on the T-shirt strips. Each row took me about 5 minutes to lay out and sew on. 6. Fold the previous row of T-shirt strips out of the way before starting a new row. 7. Repeat step 5. 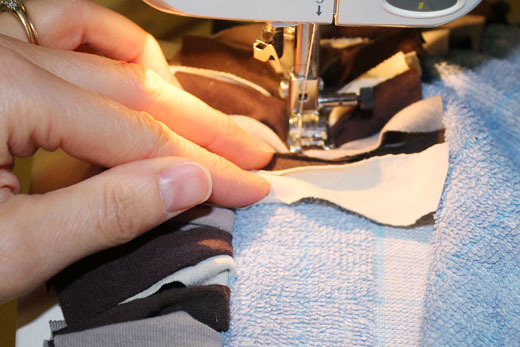 Continue in this manner until you have sewn T-shirt strips on all of the lines you marked. This is what your rug should look like now. I ended up with 25 rows of T-shirt strips. The total time it took me to cut the T-shirt strips was probably about 1 hour. The actual sewing time was probably close to 2 hours, but I broke that time up into several smaller sessions. Here is a peek at the back of the rug. Notice how my rows aren’t perfectly straight? Thankfully, this is a very forgiving sewing project. After I finished sewing my rug, I washed it and tossed it in the dryer. Here is what happened to the strips. They curled up and made the rug look totally different. I think that it was easier to sew the strips on before they were washed than it might have been if I had washed them after cutting them. However, if you want a more clear idea of how your rug will look while you are sewing it, wash all of the strips after you cut them. I am really happy with how my rug turned out. I think it will make a great bath mat and a fun addition to my bathroom. Plus, it was totally free! 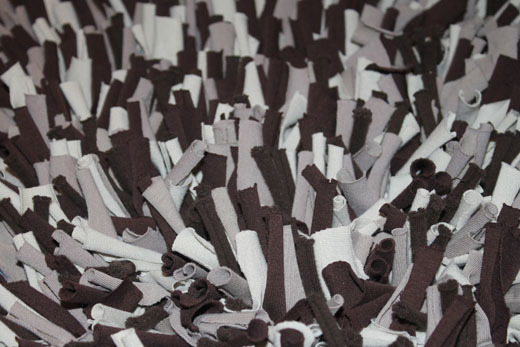 Sometime I would like to try making a monochromatic T-shirt rug. Dying white T-shirts would be a great way to ensure all of the strips are the same color. Do you have any T-shirts lying around that you don’t wear anymore? How about making a T-shirt rug? I love this! 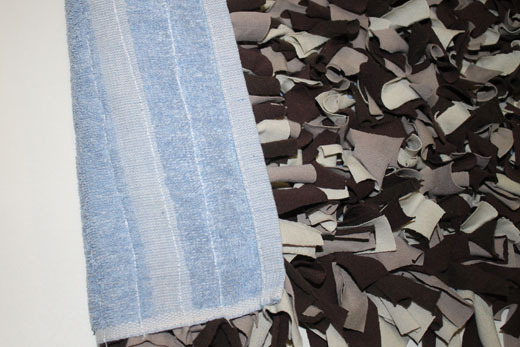 A great way to use a hand towel that has seen better days and a great absorbent bathmat. You could even add puffy paint in rows to the back to make it no slip, I bet. Oh My WORD! I love love this!!! Thank you for showing us how to make it! Thank you, Netta! I’m glad you like it. Thanks, Kristal! I’m glad I’m not the only one who dreams of craft projects. 🙂 Yes, having these rugs be machine washable is a must with kids. I bet your bright colored T-shirts will look great as rugs. Thanks for sharing this! I’ve seen all the other posts of how to make this type of rug, and you’re right- it looks like it took FOREVER to do! I’m glad you figured out a way to make such a fun rug with a whole lot less of a time requirement. Thanks for sharing! 🙂 I’m glad you like it. Happy sewing! Oh, you posted it first! I did the same thing but haven’t finished yet. I had the same idea because I’m not the most patient girl in the world and it was taking too long to finish. Great job. Thanks, Donna! Great minds think alike, I guess. Happy sewing! Amazing! You invented a way to re-use old T-shirts and old towels to make something most people need: as soft, absorbent bath mat! Love it, and can’t wait to try it on some of these old t-shirts around here! Thank you so much, Pam! I hope you enjoy making one of these rugs. I LOVE this! Totally usable. I have a bunch of T-shirts & was going to make some tote bags, but really, how many do you need? This also helps me recycle a stained towel, or one that just looks too ragged for the bath any more. Thanks, Theresa! You could use the printed parts to make him a T-shirt quilt and then use all of the leftovers to make a rug. Neat idea! I bet you could make cool throw pillows with the same method. Is your rug slippery on the floor? I am wondering what one could put on the back to give it some non-slip grip. Thanks, Kris! I haven’t had a problem with the rug slipping, but maybe adding something with a grip would be good. What a great idea! We have a HUGE stash of t-shirts which I’ve been saving to make memory quilts for your boys. Now I have a use for the remainder of the t-shirts… coordinating rugs!! thanks for the inspiration!! Love this!!! Just out of curiousity about how many t-shirts would it take to make a rug like this? I’ve been saving up my husband’s white undershirts with the yellow armpits, but I only have 5 right now and I’m wondering how many it would take to make 900 strips? Mandy, I only used 3 pairs of knit pants and a youth sized shirt. I think you would have plenty of material in 5 undershirts. You could even dye the rug once you have it sewn. Thank you so much for sharing your amazing idea! I too was wanting to make a t-shirt rug but the time commitment was holding me back . 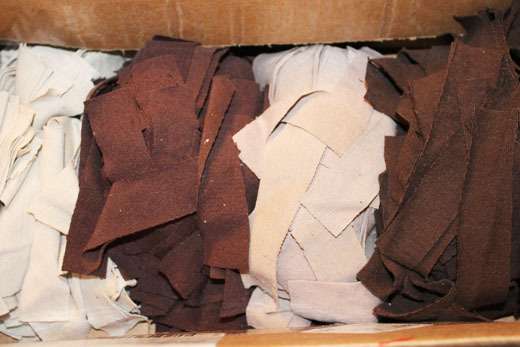 . . time to start cutting some t-shirt strips! Genius! Thanks for this great idea. I had a friend make one like this and she sewed a piece of that rubber matting they sell for RVs and campers underneath to make it non-stick. It worked pretty well. She only figured out the sewing secret halfway through though so her rug took a little more time! How nice of your friend. I am not sure exactly what they sell for RV’s, but it sounds like it would work to make the rug not be slippery. I am happy I found this pattern. Last year I was trying to crochet a t-shirt rug. It wasn’t working so I quit. This rug looks much easier. I love to crochet, but this method is definitely much quicker I would imagine. AHHHH thank you for this! I really wanted a tshirt rug but did NOT want to spend my whole life doing it! This is perfect. Now I need to buy a rotary cutter and cutting mat. I’m in love with this craft! I’d like to make one using a bath sheet. Has anyone tried to make a BIG rug? I made one 3’x3′ on a drop cloth. It isi pretty every color I had. Wish I could post a picture. That sounds like a neat idea. I would love to see a picture of the rug so it is too bad you can’t share it here. I like your method! I have knit bathroom rugs with t shirt scraps. They are very cushy and absorbent! I have a bunch of t shirt squares left over from my quilts and I have been itching to make one like this. Will def. be giving it a try! Pinned this! Thank you, Jane! 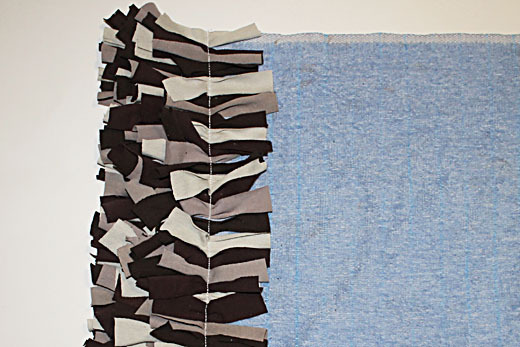 Did you end up trying this method of rug making? I’m delighted to find this! I have been collecting t-shirts to make a rug and wasn’t even too dismayed when I read projected times like 60 hours to do the latch hooking but I wanted to be able to toss it in the washing machine and you can’t do that if it is a large rug made on rug canvas. This will be the perfect solution. I can sew 2 large towels together to get the size I need and still be able to wash the rug easily. I’m so glad you like this tutorial, Lynn. I would love to hear how your large rug turned out. I haven’t made one that big and would love to know how long it took you. Cool rug! thanks for the tutorial. Great project. Makes me want to go garage saling. About how many shirts did you use for the tutorial project? Thanks. Thanks, Lisa! I actually used a couple of pairs of old stretch pants that were made of T-shirt fabric for this project. I would think the number of shirts you need would depend on how big they are and if there is a design on the shirts. I would say that if you had 3 or 4 XL T-shirts you might have enough strips. That is great, Kat! I’m so glad you liked the tutorial. I like how easy this looks, compared to other tutorials/methods! Just curious, you cut your fabric horizontally – do you think it would wash differently if cut vertically? Or, do you recommend horizontal to ensure it doesn’t fray? Thanks! Thank you, Jen! I am not really sure that it matters which direction you cut the strips. T-shirt fabric shouldn’t really fray so I imagine you would be fine either way. Let me know if you give this a try. 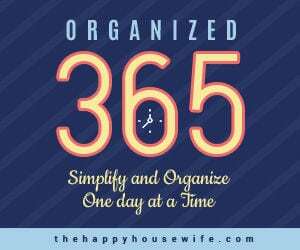 GREAT idea to cut down on the time!! I have to ask you for your opinion. 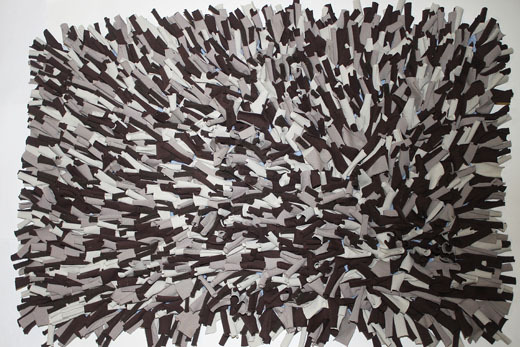 If I’m wanting to make a large area rug like this for my living room, would you suggest sewing t shirt strips on full size towels, then washing, then sewing the towels together to make a large rug? I’m going to have to cushion it somehow underneath and make it non-slip. I’m just trying to figure out how to start. These are good questions. I would try to figure out what size you want the finished product to be and then determine how many towels you will need. I might be tempted to sew the towels together first, but your idea will probably make it a little easier. 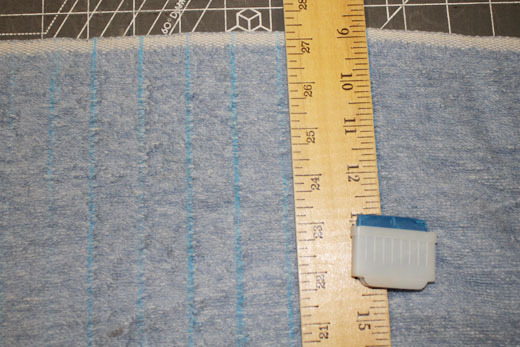 As for making it non-slip, I have heard of people using caulking or hot glue on the back and letting it dry but I am not sure how that would do if you needed to wash the rug. Foam shelf liner adhered to the back, or maybe sewn on before adding the T-shirt strips might work, too. This afternoon, I came across an ‘all you can stuff into a plastic bag for $7.00’ sale. Needless to say, after coming home with 31 (or was it 32) T-shirts in various shades of green, I knew exactly what I was going to do with them, especially after finding your site. Thank you! I have been saving old sheets to crochet a rug, wondering if I could use these sheets instead of t-shirts since I don’t have any ?? That is a good question, JoAnne. I imagine that the sheets would fray, but if that doesn’t bother you then I am sure you could sew them like I did the T-shirts. I might try a small amount as a test on a washcloth or something and then run it through the washer and dryer. That way you wouldn’t be wasting a bunch of sheets and time. Let me know if you try it. This is genius! I just finished a rag rug done by tying strips on to a thick rope and then coiling the rope and sewing (by hand) together. It took forever! Then I started a rug using the stuff you put under rugs to keep them from slipping and tied strips of fabric on to that. Well, it is moving along allot faster than the first rug I made but is proving to still be very time consuming. How lucky I feel to have found your tutorial! What a great idea! I can’t wait to get started. Although I over half done with the rug I’m currently working on I am thinking about just scraping it and start anew using your method. I could probably make two rugs using your method in the same time it would take me to finish the one I am working on now. I have never left a comment on anyone’s site before but I had to tell you how lucky I feel to have found your tutorial and how grateful I am that you shared it online. Thank you, thank you, thank you! Thank you for the tutorial, I am in the middle of a rug inspired by your article. I am using old tshirts that I have loved for so long but now need a new home. 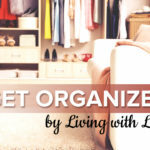 The latch hook is for me as I am not fixed for time ( I am retired) and was looking for a new craft, I am a paper crafter at heart, I used to make rag rugs with my Mother years ago when I was a child, this has brought back many memories of my childhood. I just love the idea as i was looking a simple way to sew my door mat. thank you so much . Thank you so much for this easy tutorial. I love rag rugs but never attempted to make any. I am now 75 years old and have to get some t-shirts and make one of these rugs! Bless you for sharing! Thank you for sharing! I was wondering if you could use a jelly roll?? 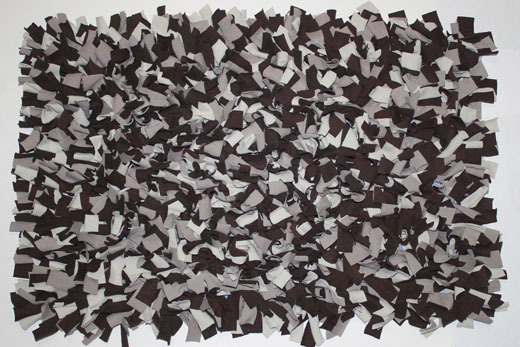 I made one of these many years ago in a class at a fabric/craft store.We used either duck cloth and/or a piece of a painters cloth.Worked very well,you could also do it with fabric scraps if you’re a sewer or a quilter with a ton of scraps. I like yours and the colors you used.